Ibanez has a long history of developing exceptional guitars for the rock, metal, and fusion shredder, and their iconic RG Series can be found in the hands of far too many rock guitarists to mention by name. Whenever you need classic humbucker tone from a solidbody electric guitar with high-performance specs, you’ll never be faulted for reaching for one of these instruments. We have reviewed some exceptional guitars in the Ibanez Premium line, and the RG1070PBZ is no different. Introduced less than a decade ago, the Premium range of instruments delivers similar quality and workmanship to the flagship, made-in-Japan, Prestige-series instruments, but at a slightly lower price point due to their manufacture in Ibanez’s Indonesia factory. The results are guitars so good that we no longer ask the question whether or not to splurge for a Prestige instrument, but simply which model guitar feels the best to us for our particular need. If you want a versatile, high-performance, shred-worthy, rock-n’-roll machine with insane looks on top of it all, your search may start and stop right here. The RG1070PBZ has an outstanding compliment of hardware and electronics to suit the wild design, none of which would matter if it didn’t both sound and play great. Fortunately, the guitar measures up in every conceivable way. We’ve played some gorgeous RG-series instruments with flamed tops in the past, but those might not be quite as hot as our RG1070PBZ Premium, dressed in a Cerulean Blue Burst finish, which looks almost like colored marble in a brown-to-blue burst finish of sorts. The body is American Basswood with a Poplar Burl top, and this top is almost otherworldly in appearance. The natural wood-colored binding sets the top off from the rest of the body, which is painted black, and the headstock shares the Cerulean Blue finish. This guitar causes everyone who beholds it to stop and take another look. The 25.5” scale neck is another beautiful point of wonder, as this Wizard neck is an 11-piece neck featuring layers of wenge/bubinga/maple/purpleheart. Many players would be surprised to know that there’s a method to this madness. Multiple strips of wood, glued together, form a significantly more dense/solid neck than a one- or two-piece neck. As such, the neck should be less susceptible to moisture-induced intonation changes, though there is still an adjustable truss rod for control over the neck’s relief. 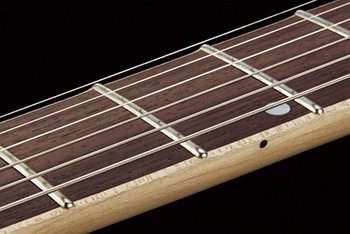 The fretboard is wenge, and is adorned with offset, mother-of-pearl inlays. The neck measures a somewhat flat, 400mm radius, and width of 43mm at the headstock and 58mm at the 24th fret. 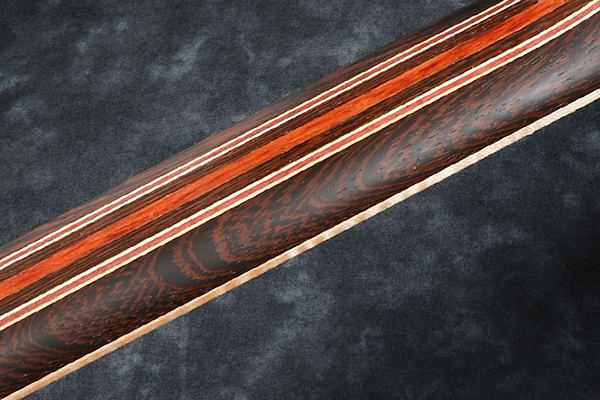 Increasing from 18mm thick to 20mm along its length, this neck is reasonably thin and well suited to fast playing. It features Jumbo stainless steel frets, with Premium-series, rolled fret edge treatment. Locking? Double-locking? Three is a charm here. The Edge-Zero II tremolo bridge features the Ibanez ZPS3Fe Zero Point System by which spring tension in the rear is adjustable via a thumb wheel without requiring use of a hex wrench. The double-locking trem has a locking nut at the headstock as you would expect, but it also has Gotoh MG-T locking tuners! Do you need this? Of course not, but we love the simplicity with which locking machine heads facilitate string changes, not to mention their added tuning stability over non-locking designs. 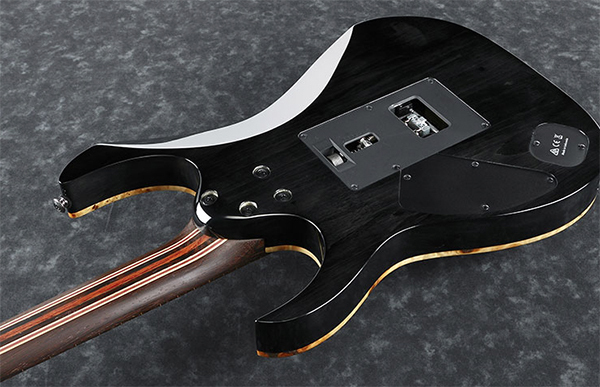 Perhaps saving the best for last, the RG1070PBZ has a fantastic array of pickups in its HSH configuration. This RG features a DiMarzio Tone Zone in the bridge, True Velvet in the middle, and Air Norton at the neck. The guitar has one volume and one tone control, and a five-way blade switch to select from the guitar’s array of tones. The Ibanez RG1070PBZ Premium plays like a dream, whether you’re looking to shred or play some funky rhythm work. Ibanez Wizard necks have sometimes felt a little bit too flat and shred-minded, but this is one of the more comfortable ones: an easy shredder, certainly, but still a comfortable neck to play for the pop and rock player, with a casual D-shape curve to the back of the neck. The fret work was great, and the rolled edges gave the guitar a more broken-in vibe. Further, the edges of the fretboard itself were also sanded down, giving the neck an even more comfortable and vintage feel. We loved the natural feel of the wood grain on the neck and fretboard, and it seemed like at most, the neck may have been treated with a small amount of oil, but no finish to speak of. The guitar is well balanced and lightweight, easy to play comfortably for hours on end. The rounded, four-bolt neck joint provided easy access to the entire fretboard, and as with other Ibanez guitars featuring Edge-series tremolo bridges, tuning stability was outstanding. Controls for pickup selection, volume, and tone, worked in typical Ibanez fashion. The five-way blade switch followed a familiar layout that ran from bridge to split pickups to middle to split again to neck. We made plenty of use of the whammy bar, which snaps in and then has an adjustable torque cap (our favorite variety, as we could set the arm to swing free or stay fixed in place) and we never knocked ourselves out of tune… for weeks! For subtle vibrato work, this tremolo worked extremely well, too. Our only annoyance: yes, you must cut the balls off the strings with the Edge-Zero II bridge. When we saw this guitar at the Winter NAMM Show and discovered that it came loaded with two of our favorite DiMarzio pickups of all time, we knew it was something we needed to get in the studio for review. Truthfully, we hadn’t played a Tone Zone-equipped guitar since back in the early ‘90s, when every guitarist chasing “hair band” tone dropped this high-gain pickup into the bridge position of their Super-Strats… or, like ourselves and many fusion fans, into their sleek, Ibanez 540S guitar. But when sharing our excitement about this guitar, we heard comments about this being such a dated pickup. Clearly, those words came from fond memories of the pickup, as opposed to comments from players currently using it. Thus, playing the Tone Zone today wasn’t so much a retro experience as it was re-discovering a classic, and in this guitar, it sounded fabulous. 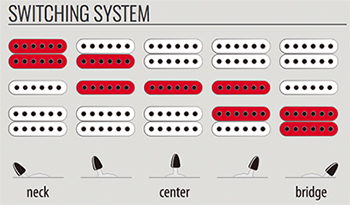 By today’s standard, the Tone Zone isn’t especially “hot” as pickup designs have evolved (even within the DiMarzio family), but it still drives your amp as hard any Les Paul equipped with a humbucker. The tone in the bridge position is very smooth and full, with clear highs, a neutral middle, and a tight low end. 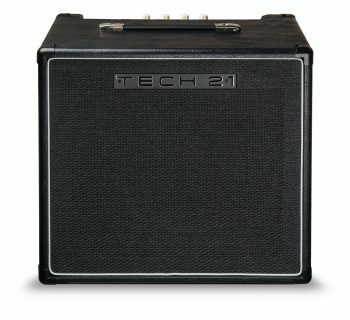 Through high-gain amps like an ENGL PowerBall II and Hughes & Kettner Triamp Mk. 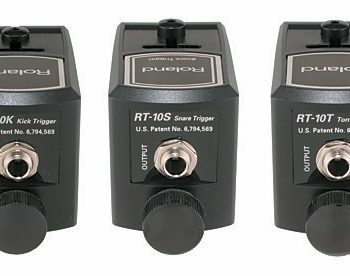 III, the Tone Zone-loaded RG1070PBZ was capable of delivering all the hard rock and metal tone we needed for everything from classic rock to prog metal. We appreciated the clarity of this pickup for our Alex Lifeson chords, and even on clean amp settings, we never found the sound too harsh. The neck pickup is a current favorite of ours, and you’ll find it in a lot of our HH and HSH equipped instruments. The Air Norton delivers a velvety smooth lead tone, perfect if you chase John Petrucci’s liquid lead tone or the Latin vibe of Carlos Santana. In between, you’ll find the DiMarzio True Velvet, a vintage-voiced single coil that honestly, we would have favored removing from the guitar in favor of a simpler HH pickup configuration. While a guitar sporting a few of these pickups usually has the middle-position True Velvet wired with reverse polarity for hum canceling on those in-between Strat positions, we think it’s just normally wired here, as the pickup by itself definitely exhibits some single-coil noise. In the second and fourth positions, though, combining a single pole from either of the adjacent humbuckers resulted in much lower noise. It wasn’t as quiet as the humbuckers on their own, but certainly close enough to not be of concern to demanding players, and a muffled cry from the familiar 60-cycle hum heard when playing the middle position on its own. It was bright, clear, and well balanced across all six strings, though we never found ourselves gravitating towards use of this middle position on its own. The tone in those in-between positions is spanky Strat city! For clean, jangly, and funky rhythmic work, both positions sounded fantastic, and the choice of an American Basswood body really brought out the Strattiness of the sound here. It should be noted that the bridge and neck positions avoided the quacky sonic characteristic of Strats and leaned more closely to the sound we equate with mahogany solid-body instruments. Ibanez includes a multi-language instruction manual that provides full details regarding care and maintenance, adjusting the tremolo unit, and changing strings. The Ibanez website is full of helpful videos and detailed product information, too. The Ibanez RG1070PBZ Premium (MSRP $1,791.10) sells for approximately $1,300, and it includes a clever “soft hard” case as well as a fabulous Ibanez multi-tool for guitar maintenance. 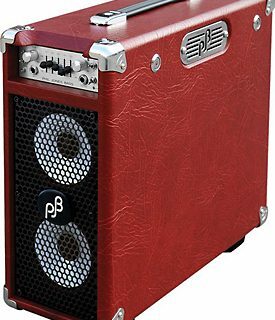 The case is basically a foam-lined, nylon wrapped container that is super light in weight yet provides more protection than a simple gig bag, and its rigid nature enables it to balance fine on its side just like a traditional hard case. Still, it’s not the kind of case you’d want to check on an airplane. We actually wished that it were cut smaller to the shape of the instrument for easier use as a carry-on guitar bag instead of maintaining a full hard-case shape. Oh well. It’s still a pleasure of a case. The RG1070PBZ offers an outstanding value, as there’s nothing more we could ask of it had it come from the Prestige line in Japan. The guitar plays great and sounds great, and features premium hardware and pickups. Ibanez always delivers outstanding value in their instruments, and the RG1070PBZ guitar is an obvious testament to that fact. Just add your own strap locks and get ready to rock. This guitar will turn heads and may even help you to play just a little bit faster.